This anthology of speculative fiction stories on the themes of colonialism and cultural imperialism focuses on the viewpoints of the colonized. Sixteen authors share their experiences of being the silent voices in history and on the wrong side of the final frontier; their fantasies of a reality in which straight, cis, able-bodied, rich, anglophone, white males don’t get to tell us how they won every war; their revenge against the alien oppressor settling their “new world”. This theme struck me as a brilliant idea, and kudos to the anthology's creative team for persevering with this project. We need more stories based on that theme in both SF and SFR. I'm certainly looking forward to reading the anthology. 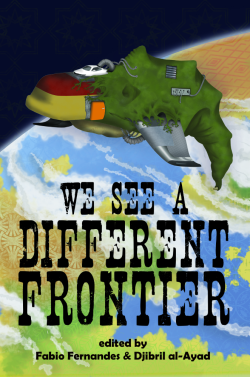 WE SEE A DIFFERENT FRONTIER includes a story by Sandra McDonald, an author whom I've blogged about several times because of her fun romantic SF trilogy THE OUTBACK STARS! According to one of the editors, Ernest Hogan's story has a kind of romance in it. Joyce Chng and Lavie Tidhar's stories feature romantic relationships, but not the front and center/romance genre convention kind. Click here for the table of contents, buy links, and other information about WE SEE A DIFFERENT FRONTIER. Also thanks to Twitter, I learned about a blog carnival celebration for the release as well as an open call for "…guest posts by other in or with an interest in the underrepresented vertices of the speculative fiction world." I reached out and was invited to submit a post. I really appreciate the opportunity to discuss science fiction romance in such a context. My post is "Come For The Science Fiction, Stay For The Romance." While there, you can enter for a chance to win a digital copy of QUEENIE'S BRIGADE, my space-prison set sci-fi romance from Red Sage Publishing.